Dispense 10ml of product into clean hands. Massage through the hair, down to the ends and wherever there is damage. Section the hair and blow-dry it smooth with your ghd hairdryer, then dry divide the hair into small sections and pass your ghd styler over each section to seal the product. I tried this thing and I was surprised. after the procedure my hair became smooth and remained so even after washing my hair. I use this with my hair iron, it has a nice smell and keep my frizzy hair in place. 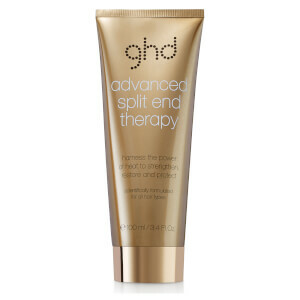 Purchased the GHD hair straighteners for the misses in a gift pack along with the Advanced Spilt End Therapy stuff. She's only used this spilt end therapy once and is happy with the results. As a bloke it's hard to write a review on something that us blokes don't use (some blokes might use it but it's not my thing). The misses is happy and therefore it's a thumbs up from me. Got this complimentary when I purchased the straightener. Both work awesome, no frizziness at all. I will definitely repurchase this. Can no longer live without this! I simply cannot live without this product now! It does exactly when it purports to do, leaving hair with a gleaming sleek finish. Highly recommended! Not too impressed with this,didn't feel it did much for my hair. I have thick hair and only used the size of a 10p, my hair felt heavy with residue init and not free flowing. On the plus side I think this does repair hair and would prefer to use it as a pre-wash treatment. I like this product, works as it should but you have to use a bit more than I thought. Otherwise good use out of this.